When you think of anti-ageing treatments for the face, you tend to think of skin creams and chemical peals or even cosmetic surgery. But did you know that many ancient cultures promote facial massage as a very effective anti-ageing treatment for maintaining a youthful glow? To understand why facial massage may be so effective, it’s important to first understand the structure of the skin. What we call “skin” is in fact made of 3 layers: the top layer, called the epidermis, acts as a barrier against bacteria and other micro-organisms, as well as protecting against injury and temperature extremes. It also regulates the evaporation of water from the body through the skin. The middle layer, called the dermis, contains the important components such as elastin, collagen, blood vessels and nerve endings. The final bottom layer is primarily made up of subcutaneous fatty tissue and also houses the bases of sebaceous and sweat glands and hair follicles. Together, these layers work together to perform important functions, such as regulating temperature and atmospheric conditions – and in particular, on the face, working in conjunction with different facial muscles to provide non-verbal communication. Of course, as we age, the skin on our face becomes affected in a number of ways. Not only do cells now live for much shorter (less than half the time compared to when you were a child) but certain components within the skin layers start changing. For example, elastin starts disappearing which in turn affects the collagen and leads to a “flattening” of the skin. The bottom layer also loses a lot of its fatty tissue and water content, leading to lack of tone and elasticity in the skin. This means now that as we engage in facial expressions, such as smiling and frowning, the facial muscles start to crease our facial skin, leading to fine lines, wrinkles, skin folds and creases. This can be further exacerbated by lifestyle factors, such as stress, diet, smoking, pollution and sun exposure. So how can facial massage help? Essentially, it promotes increased blood flow to the skin of the face and this in turn means more oxygen flows into the area, bringing nutrients for renewal. This leads to increased flow of energy to the skin, as well as stimulating the underlying muscles which hold your facial skin in place. This helps to prevent the signs of premature ageing by preventing skin sagging and increasing muscle tone and skin elasticity. 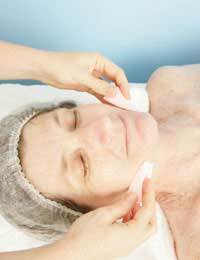 Facial massage also stimulates lymphatic drainage so that more ageing toxins are flushed away. The act of massage can also lead to release of facial and neck tension and relief of water retention, all which help to add to a more fresh, youthful appearance. Finally, the act of massage itself is very relaxing and enjoyable, leading to the release of endorphins and the reduction of stress – which further contributes to the overall anti-ageing effect. Although different types of facial massage will be favoured by different practitioners, they all share certain elements in common. The patient will usually lie facing upwards on a comfortable surface, with towels covering their shoulders and restraining their hair out of the way. The skin on the face will be gently cleansed first, according to skin type, and then a light moisturiser might be applied. If the Ayurveda method is being followed, this moisturiser will be replaced by essential oils or herbs diluted in a carrier oil. Next, the massage therapist will use light pressure strokes to apply symmetrical circling motions across the face and cheek muscles, which help to relieve tension – in particular by applying pressure in the hollows of the eyes. The massage will often extend to the chin and neck or up to the scalp for additional stress relief. Another type of facial massage, called an Acupoint Facial, has a slightly different focus. This follows the same principles as acupuncture and incorporates the stimulation of acupressure points in the course of the massage. As the points are believed to be connected to the meridians of the body through which energy or Qi flows, massaging these points will not only improve blood flow but also unblock any Qi channels as well. Essential oils can also be used in conjunction with this massage method to further repair and nourish the skin. (Remember, the use of essential oils is not advised for women in the early stages of pregnancy).